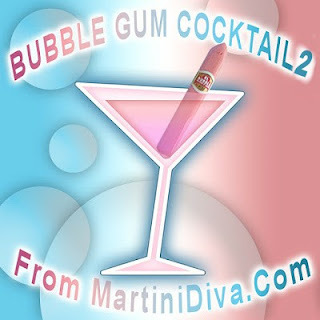 Bubble Gum Martini 2 - The Remix! Recently Three Olives Vodka came out with a new bubble gum flavored vodka, Bubble. A few years ago I posted a recipe for a Bubble Gum Martini as part of my retro candy inspired martini series. That was back in the days before bubble gum flavored vodka. With the advent of this new, fun vodka I had to give the Bubble Gum Martini another whirl. This time I've used Three O's Bubble, half & half and a splash of Grenadine to give the martini that distinctive pink color. I have to admit this is a lot easier and the bubble gum taste is spot on, it's like I had a glassful of Bazooka.